An interest in his grandfather's World War II activity led a student from Waterhen all the way to the National Historica Fair in Saskatoon this summer. 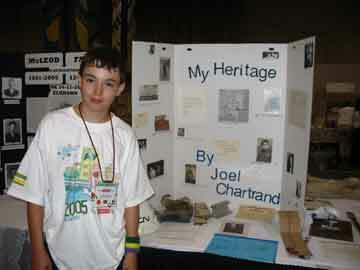 Joel Chartrand was part of the Manitoba delegation of 14 students to join 165 others from across the country in an exploration of the past. The 12-year-old researched a project on his grandfather William Watt's service in World War II. With the rest of his school, the student worked on the project for two weeks in the spring, noting it was hard to find artifacts. Chartrand said his grandmother was his greatest resource finding artifacts and describing pictures. She met her husband in Nijmegan, Holland and moved to the family farm in Fairford with him in 1946. After that, Watt began working for CN in a career that lasted 30 years. The project was a family affair with Chartrand's mother, father and uncle helping out. The Waterhen School student said he enjoyed investigating his grandfather's history and learned a lot about him. Chartrand was selected to attend the fair from a pool of 220, 000 students from over 1, 000 communities selected to attend the fair. Spending a week in Saskatchewan, he toured several historic sites such as Batoche, Fort Carlton and the Diefenbaker Canada Centre. Along with students from Resolute Bay to Labrador City, Chartrand learned about Northern Plains First Nations, attended a pow wow, visited a farm and several parks. The Grade 7 student thought it was fun to meet new people and tour the area. The high point of the week, he added, was making new friends with whom he intends to keep in contact. The week ended with the 11th Annual Historica Fair on July 15, where Chartrand explained his display to interested visitors. There were several firsts on the trip for the young man. Chartrand said it was the first time he flew in an airplane. It was also his first trip to a museum, which he enjoyed. The Anne Frank exhibit, he added, left quite an impression. There were four chaperones with the Manitoba group but none of them were from Waterhen. Students from Waterhen, Deloraine, Winnipeg, Elkhorn, Souris and Brandon first met in Brandon and Chartrand said he was quickly comfortable with them. Pleased to have the opportunity to travel, Chartrand said it is important to learn about other people's heritage. He added the experience has him thinking he will study history when he is older. The Historica program is designed to interest children in the past and is sponsored by the Hudson's Bay Company, RBC Foundation, Scotiabank Group and Canadian Heritage through Exchanges Canada. Republished with the permission of the Dauphin Herald.